President Obama has been compared with a number of former presidents, sometimes appropriately, sometimes not. But on Friday morning, when he spoke in Hiroshima of forging a future “that makes war less likely and cruelty less easily accepted,” he renewed a connection between his presidency and that of a predecessor who finished his service before Obama was born: Dwight David Eisenhower. This world in arms is not spending money alone. It is spending the sweat of its laborers, the genius of its scientists, the hopes of its children. The cost of one modern heavy bomber is this: a modern brick school in more than 30 cities. It is two electric power plants, each serving a town of 60,000 population. It is two fine, fully equipped hospitals. It is some fifty miles of concrete pavement. We pay for a single fighter with a half-million bushels of wheat. We pay for a single destroyer with new homes that could have housed more than 8,000 people…. This is not a way of life at all, in any true sense. Under the cloud of threatening war, it is humanity hanging from a cross of iron. This conjunction of an immense military establishment and a large arms industry is new in the American experience. The total influence—economic, political, even spiritual—is felt in every city, every State house, every office of the Federal government. We recognize the imperative need for this development. Yet we must not fail to comprehend its grave implications. Our toil, resources and livelihood are all involved; so is the very structure of our society. Eisenhower was no pacifist. But his words earned him the enmity of the right wing of his Republican Party. As a man whose background as a general had done much to make him president, however, he believed it was necessary to question unthinking militarism. Obama is no pacifist. But, with speeches throughout his tenure, he has advocated for alternatives for war in ways that have earned this Democratic president the enmity of a Republican Party that is a good deal more extreme than in Eisenhower’s time. As a man whose opposition to an unnecessary war did much to make him president, however, he has continued to speak of the prospect for peace. Obama delivered a speech that challenged not just other leaders and other nations but his own administration and his own nation to do more to avoid that destruction. Obama’s critics attacked his visit with language as harsh at that once directed at Eisenhower. 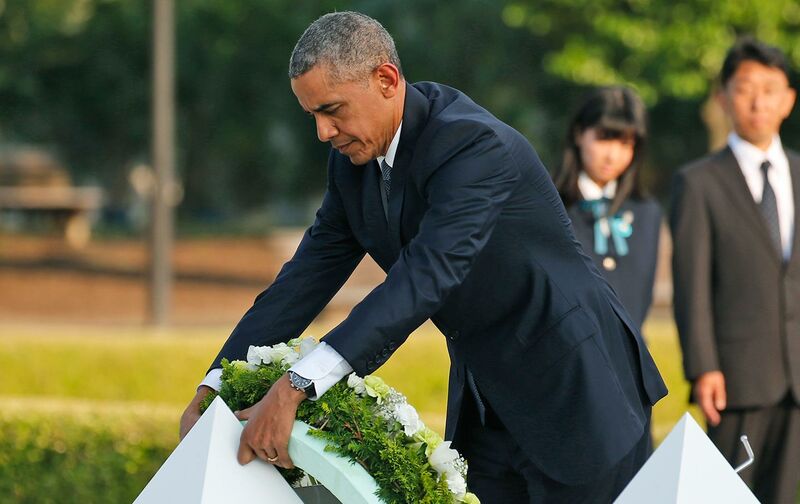 “Obama’s shameful apology tour lands in Hiroshima,” read the headline of an article by former ambassador John Bolton. The President has taken the important steps of completing the New Start Treaty, the Iran agreement, limiting the role of nuclear weapons and several Nuclear Security Summits. At the same time, his administration has proposed the largest increase in spending on nuclear weapons and their delivery systems in recent history—$1 trillion over 30 years. Additionally, during his term, the reduction of US nuclear weapons has been the least since post cold war. President Obama has six months to solidify his nuclear legacy and ensure that his early Nobel Prize was deserved. This historic presidential visit to Hiroshima by Obama needs to be followed by historic nuclear weapon reductions.